Magick squares are used to draw in the influences of their corresponding planet. Be mindful that with any work of magick, where you include the universal forces, they must be in harmony with your intent. 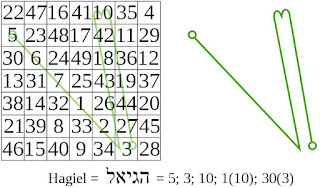 A magick square (kamea in Hebrew) is an array of numbers arranged in a square so that the sum of any row is equal to the sum of any column. For most magick squares, the sum of either of the diagonal also equals the sum of either a row or column. Magick squares have been esteemed for their magickal and mathematical properties for thousands of years in China, India, and the Middle East. The most common use for these Kameas is to provide a pattern upon which to construct the sigils of spirits, angels or demons; the letters of the entity's name are converted into numbers, and lines are traced through the pattern that these successive numbers make on the kamea. In a magical context, the term magic square is also applied to a variety of word squares or number squares found in magical grimoires, including some that do not follow any obvious pattern, and even those with differing numbers of rows and columns. The derivation of the sigil of Hagiel, the planetary intelligence of Venus, drawn on the magic square of Venus. 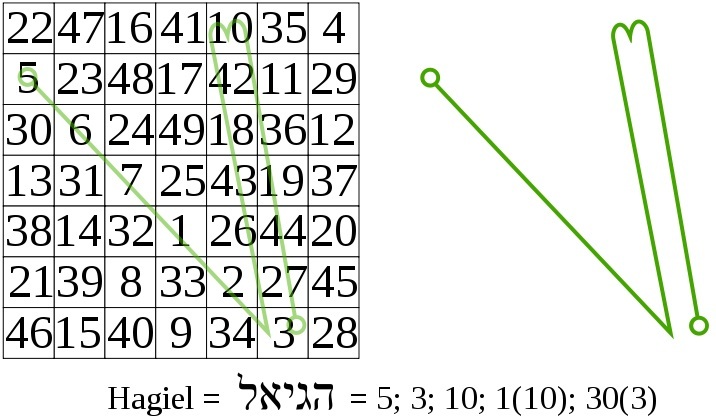 Each Hebrew letter provides a numerical value, giving the vertices of the sigil. There are eight different arrangements of a nine-division (3x3) magick square. There are 880 ways to arrange a 16-division (4x4) magick square. However, we are only concerned here with the seven kamea, which have been traditionally associated with the seven planets in practical qabalah. Each of these kamea is associated with a planetary Sephirah on the Tree of Life. Each kamea has a “seal,” which is a geometric diagram designed so as to touch upon all the numbers of the square. The seal is used in talismanic magic to represent the entire pattern square and to act as a witness or governor for them. The seal is the epitome or synthesis of the square. There are also an “Intelligence” and a “Spirit” connected with each kamea which are derived from the key numbers of the square using techniques of gematria. The Intelligence of a planet is viewed as an evolutionary, guiding, inspiring, or informing entity. However, the Spirit of a planet is traditionally considered more of a blind or neutral force. If the numerical equivalent of a letter does not exist on a given kamea, the number is “reduced” to the next lowest value in the same division of the Aiq Bekar until it fits onto the kamea. A letter should never be reduced further than necessary. The resulting numerical sequence is then traces on the appropriate kamea to produce the sigil of that name. The traditional seals and sigils do not in all cases follow the entire numerical sequence of each name. Some of the longer sigils seem to have been shortened or compressed for easier use. In any case, I am reproducing them in essentially the same forms given by both Wm. Barrett and Israel Regardie, as these are the traditional forms of the sigils. Here is detailed (in an abridged form) an ancient form of magick that has been presented traditionally and updated for modern practitioners. They illustrate the incorporation of magick squares and sigils for greater success in your workings. Magick squares are used to draw in the influences of their corresponding planet. Be mindful that with any work of magick, where you include the universal forces, they must be in harmony with your intent. Each Magick Square represents a matrix of planetary energy. Magick squares are based on the original work done by ancient mathematicians in their description of numbers. Magickal practitioners expanded on this to carry over the correlation between a number and its corresponding planet, therefore representing planetary energy in a mathematical format. A magick square is made up using three key numbers. The first one is the planetary number. The second is the square of the planetary number (or the planetary number multiplied by itself). The third is the sum of the square (or all the incremental numbers starting at 1 that it takes to fill the boxes in the square added together and then divided by the planetary number). The best way to understand this is by example so for illustration we'll can the planet Saturn. Saturn is represented by the number 3. Start by drawing the magick square with 3 boxes horizontally and vertically for a total of 9 squares (the square of 3 being 9). This makes the sum of the square in this case 1+2+3+4+5+6+7+8+9 equaling 45. Now 45 dividing by Saturn’s planetary number of 3 this equals 15. Each row of numbers in the magick square, horizontally and vertically, must equal 15 (the sum of the square of the planetary number of 3). When drawing the Magick Square, all numbers should be placed in the square, in sequence beginning with number 1. This is the magick square representing Saturn. Notice that the square is 3 by 3 and that all the rows equal 15. The word “sigil” comes from the Latin sigillum, meaning a sign or signature. In magickal terms a sigil is a (unitary) glyph derived from a name, word, or magickal formula by means of a direct analogical process (such as numerical conversion and tracing upon magick squares [kamea]). If the appropriate process is reversed, then the name or word may be retrieved from the pattern of the sigil. However, if the sigil is condensed or compressed, or if it was generated by using a system that you are unfamiliar with, you may be unable to decipher it by reversing the coding process. This is particularly true of sigils that were created or obtained through trance or other non-standardized methods. In these cases, it may be necessary to examine them through intuition, divination, or “astral inspection” in order to determine any word, name, or meaning connected with them. The important idea is that the seed or essence of a force, concept, or pattern is equally in the sigil and the name (logos). Sigil and name are the two facets of the same thing. They could be said to relate much the same as the Sanskrit terms yantra and mantra do. There are many applications and forms of sigils besides those of the Planetary Spirits and Intelligences. Your own name can be converted to numerical form and traced on planetary kamea to provide a sigil of yourself in the aspect of that particular planet. This could be useful for work with talismans, ritual invocation, or direct meditation. There are many other uses and variations. It can be viewed a symbol of our intent. Sigils incorporated with other influences add direction and focus to spell work. Sigils may be traced in the air, carved on candles, drawn on paper and burned, etc. Sigils may be drawn or formed using the magick squares that are described above. Saturn rules financial institutions and dealings, such as banks, real estate transactions, investments, educational institutions, etc. Example: If your intent is for successful investing. You would want a sigil to represent yourself at being successful in your investment endeavors. So by choosing the word investor to be your sigil, the visualization is of the self as a smart investor, surrounded by favorable aspects and clear choices to make our money grow. This is one method using the Western system of numerology. Each letter has a numerical equivalent assigned to it (see chart below). Take our key word, investor, and map it to the chart shown above. Starting with your first corresponding number and continuing through each in order, you draw out your sigil. 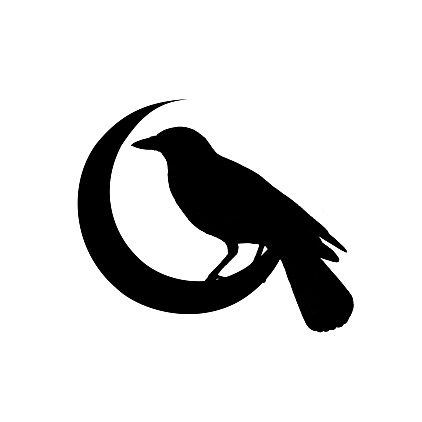 To use this sigil you might incorporate some of the other correspondences for Saturn. Start by carving the sigil into a black candle anointed with bergamot or cypress. Then surround the candle with onyx and place it on top of the world card from a tarot deck. As you light the candle and focus your objective. Now you have drawn in many aspects of Saturn with crystals, oils and tarot, and personalized your aim with the sigil.